Many different noise sources are present in our houses and generally in our lives. Trocellen keeps developing foam solutions to provide the best thermal and acoustic insulation to increase your comfort. 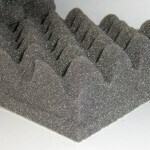 Flexible, open cell polyester-based polyurethane foam used for sound-proofing. Airsilent can be cut into ashlar or pyramid shapes making the product aesthetically attractive for external use. The black or metallic film covering is applied for protection, making the foams resistant to dust and humidity, prolonging its life span.